A guacamole that’s as Greek as it is Hispanic. “Reduced Guilt”, as in Trader Joe’s Reduced Guilt Chunky Guacamole, is one of those phrases that are a little too marketing-y for me. What does that really mean, “reduced-guilt”? We all just want to enjoy ourselves in life, right? If you’re like me, that means repressing and/or ignoring the constant nagging feeling of guilt that would otherwise hound you at all moments, threatening to drag you down the muddy hill of self-loathing into the murky bogs of depression. Free-floating guilt, we all got it – do we really need Trader Joe insinuating it into our lives even here, in the vegetable aisle? Here I was, in danger of feeling pretty good about myself for a moment, putting a bag of shredded carrots into my cart, making positive decisions and following a healthy path! Except, oh man, there’s the Reduced-Guilt Guacamole. “Reduced-guilt” because consuming calories induce guilt, and guacamole has a lot of them. Ergo, eating this guacamole means I don’t have to feel as bad about myself. Hooray! Except, wait – doesn’t everything have calories? Even my bag of carrot shreds? And I have to eat calories to live… but eating calories induce guilt… and, oh no, I’m never going to win ever am I? Sure, I can reduce guilt – but never eliminate it. Never escape the inherent guilt of calories. Never escape the vicious cycle of consumption and loss until, at last, death claims me. And there I am again, down in the bogs of depression. Thanks a lot Trader Joe’s. Assuming you made it this far in this post, or have a healthier sense of self-worth than I do, you’re probably wondering a couple things about this guacamole. For one, you’re probably wondering if “reduced guilt” in this case is actually a synonym for “bad tasting”. Unfortunately, the answer is yes. That said, I feel we have to judge these sort of “healthy option” food products on a curve. We all know that the healthy option isn’t going to taste as good as the real, full calorie, thing. The question is, does the healthy option hit that sweet spot of tasting good enough for how few calories it has? A little while ago we saw Trader Joe’s Fat Free Brownies undergo this test. Trader Joe’s Reduced Guilt Chunky Guacamole does a little better, not because it tastes all that good, but because it’s a really damn healthy option. Each 1 oz serving of this guacamole contains only 30 calories and 2 grams of fat. That’s 40% fewer calories, and 50% less fat than Trader Joe’s Avacado’s Number Guacamole. With half the calories, does that mean it only tastes half as good? Yes, actually – that’s a pretty good description of this stuff. This low fat version of guacamole definitely lacks the full-bodied flavor and punch of a regular guac. When you take a dip of it, it starts to taste good but then stops about half way, leaving a vague sense of dissatisfaction. On the other hand, it manages to match the creaminess of regular guac and is just as filling to snack on. That’s not bad for a diet food, where managing to come out even is practically a win. 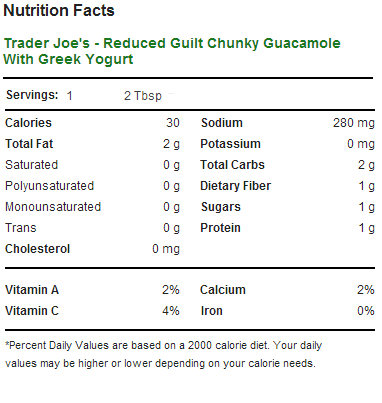 To put it another way, for a low calorie dip this stuff is pretty good, but for guacamole it doesn’t really pass snuff. A big part of that is because you’re only getting about half as much avocado as usual in your guacamole. The rest is made up for by non-fat greek yogurt. I can only imagine that this non-traditional ingredient is the main reason this guacamole doesn’t get the traditional “Trader Jose’s” appellation. Part of me wants to praise Trader Joe’s for going out there and making a healthy guacamole alternative. However, I can’t help but think it’s all rather pointless. After all, guacamole’s only really good with chips – and there’s nothing remotely diet friendly about a bunch of tortilla chips. Yes, I suppose you could eat this with some celery sticks or such, but in that case wouldn’t you be much better off with some low-fat ranch dressing instead? Even Trader Joe’s Veggie Chip Potato Snacks and crunchy lentil curls aren’t quite so healthy enough that the diet conscious could feel free to go out and eat a big handful. 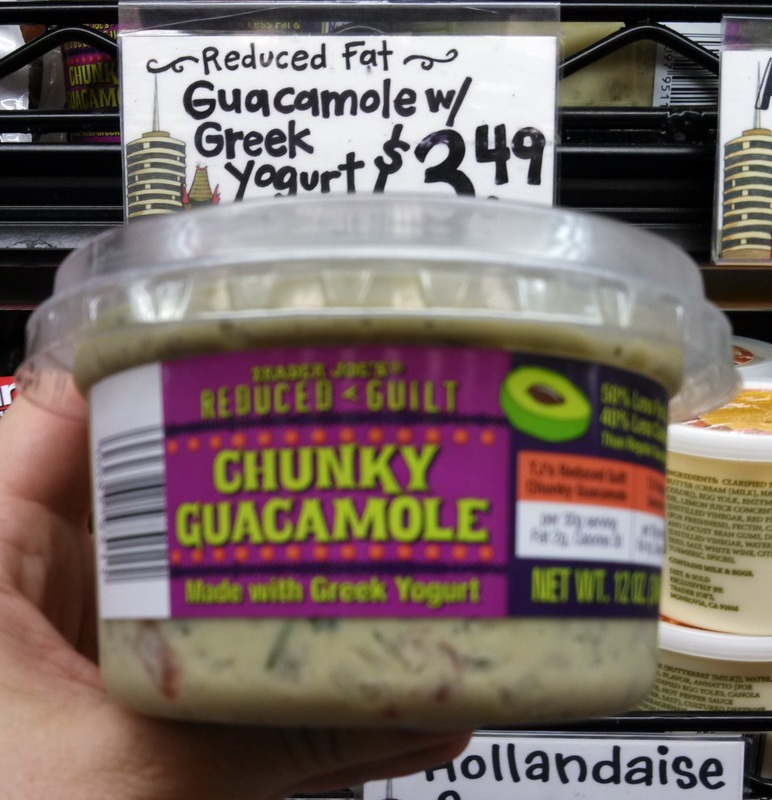 In the end, I guess Trader Joe’s is true to their word – you get a guacamole that reduces your guilt, but doesn’t absolve it. Would I Recommend It: Not really. It’s fine for a healthy dip, but there aren’t a lot of healthy ways to enjoy it. Would I Buy It Again: No, I think I’ll stick to the real stuff. Final Synopsis: A low calorie guacamole with half the calories and about half the taste. But… But… This is my favorite Trader Joes item ever! Sure, it doesn’t match the taste of real guacamole. But the yogurt gives it a really nice tang. I think their mistake was marketing it as a healthier guacamole version instead of the delicious avocado yogurt that it is. here’s how I make real Guacamole: smush avocadoes, add minced jalapenos and onions. add salt and pepper to taste. that’s it! what you get is the real taste of avocadoes and a Guacamole made in the style that I had in Mexico.